Special features: Four spot orb weavers (Araneus quadratus) are fairly common. They can be found throughout the U.K. in the summer and autumn months. The body colour of is extremely variable. They can be; yellow green, orange, red or brown. The abdomen has some white patches, but these are only really clear on the brown individuals. 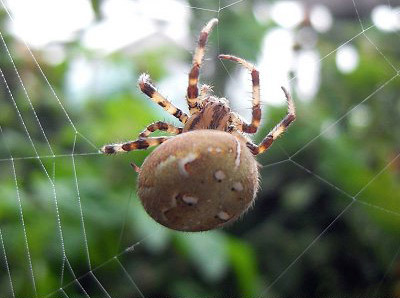 Usually the four white spots on the abdomen which give this spider its name are visible. Four spot orb weavers catch their prey in a web, and the females also build a retreat to the side of the web, made from thick silk.